Bure’s healthy lifestyle has been featured in US Weekly and People magazines as well as national talk shows including The View and NBC’s Today. 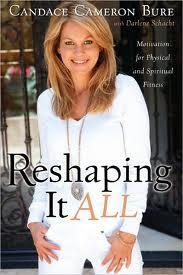 In Reshaping It All, she continues the story, inspiring women to embrace a healthier lifestyle by moving faith to the forefront, making wise choices, and finding their worth in the eyes of God. Candace shares a candid account of her struggle with food and ultimately her healthy outlook on weight despite the toothpick-thin expectations of Hollywood. More than a testimony, here is a motivational tool that will put readers on the right track and keep them there. In addition to practical advice, Candace offers a biblical perspective on appetite and self control that provides encouragement to women, guiding them toward freedom. Wow! I was really surprised by this book! It was MUCH more than I thought it would be. I found out about it because I kept seeing #ReshapingItAll all over my Twitter. WHAT was it? So, I Googled it. I thought the summary sounded good, and I really needed something to help me reshape my life after having a baby. So I bought it on Kindle and started reading it immediately. The book is FULL of personal experiences from Candace's life. Her struggle with weight/self image, and her Christan beliefs. I was wondering what God had to do with weight loss? I'm even Christian! But, the more I read the more I understood. It is about self control. It is about controlling the natural man. It is about respecting our bodies and living for the future, not just for today. It is about taking care of our bodies and teaching our children to do the same. I have been telling myself that I just don't have the will power to lose weight. Candace talks about pushing ourselves. She talked about athletes. Her husband is an Olympic medalist in hockey! I couldn't relate, but I did think about how I go without sleep constantly to take care of the baby. I don't think, I just do it. WHERE does that come from? I have some form of self control. If I could do that then why not with food? Candace doesn't have a typical diet "plan". Hers is a lifestyle change. It is actually pretty simple. Watch your portions. Eat whole grains, fruits and veg. Exercise. And pray. Bring The Lord into your life. Let Him help you with your quest. Ask Him for help with your self control. I have already started implementing some changes. I went for a walk today, cut out soda this past weekend, and a friend brought over some carrot cake and I only had a few bites and threw the rest away! They are small steps but I'm heading down the right path. This isn't just a "diet book" it really is Reshaping Your Life! It is chock full of recipes, motivation quotes that are easy to find, scriptures to help you on your quest, and stories to keep you motivated. I loved reading about Candace's life and learning how to get my life in control. I say go get the book! I will be re-reading this as I implement my changes into my life! I'll let you know how it goes! Hi! I found your blog when Candace Cameron Bure retweeted you! Love it. I've enjoyed looking around & reading some old posts, we have similar likes. I also found your blog after Candace tweeted it. I am so excited! I am reading the book right now and really enjoying it. And I look forward to returning here often! Also, so cool that Candace retweeted you! I just got this on audio. I'm really looking forward to it. I also want to try her new one but I'm thinking I will hold out for the audio.